Honolulu’s traffic among worst in U.S.
Forty hours sounds like a typical workweek. But that's how long motorists are stuck in traffic each week where Moanalua Freeway's eastbound lanes meet the H-1 freeway from the airport. That logjam contributes to Honolulu's rating as the worst U.S. city for rush-hour slowdowns, according to a private survey released by a Seattle firm. "If you happen to be driving on a Thursday from 5 p.m. to 6 p.m. on its main highways, you're no longer in the Aloha State," says the report compiled by INRIX. "You're in the worst place and worst hour of any single roadway in the U.S."
The study looked at the prevalence of traffic congestion, ranking Honolulu 38th of 100 cities, and also at how much slower traffic was during congested times. Cities like Los Angeles and Chicago would top any list of the nation's worst traffic areas, including a study released yesterday by a provider of national traffic trends. But Honolulu? "If you happen to be driving on a Thursday from 5 p.m. to 6 p.m. on its main highways, you're no longer in the Aloha State," according to the report compiled by INRIX. "You're in the worst place and worst hour of any single roadway in the U.S., taking 88 percent more time to get where you're going than if there were no congestion." INRIX, a privately held Seattle-based corporation, yesterday released its National Traffic Scorecard, and ranked Honolulu as having the worst drive-time travel time in the nation. "Travel time" means comparing the amount of time driving during a peak traffic period to a noncongested period. 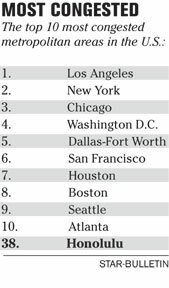 But the survey doesn't list Honolulu as having the worst traffic congestion: The city ranks 38th out of 100 cities surveyed. Founded in 2004, INRIX provides real-time traffic information to more than 55 clients in North American and Europe, including various global positioning system companies, MapQuest and Microsoft. Its network includes more than 800,000 GPS-enabled vehicles and cell phones. 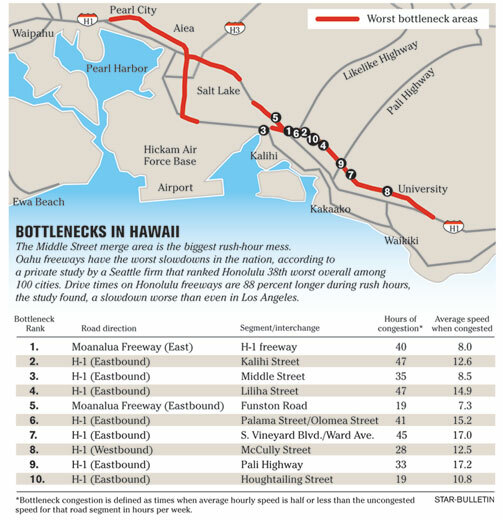 Honolulu also has two of the 100 worst bottleneck areas in the country. Ranked 41st are the eastbound Moanalua Freeway lanes by the H-1 freeway interchange, with an average congested speed of 8 mph. And ranked 87th are the eastbound H-1 lanes by Kalihi Street, with an average congested speed of 12.6 mph. 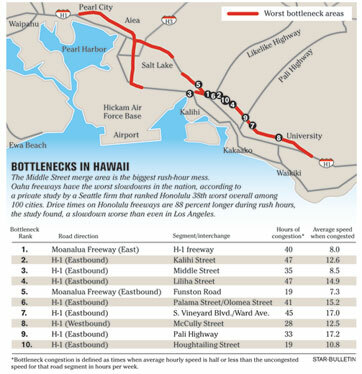 Those spots are the worst and second-worst bottleneck areas in Honolulu. The third-worst bottleneck, and the 104th in the nation, is the H-1 freeway eastbound near Middle Street. "Regions like southwest Connecticut, Honolulu and Austin may not rank high in terms of overall congestion, but it's a safe bet that if you are on highways in these regions in peak hours, congestion is the norm," the report stated. The company used 2007 data of about 31,000 urban highway roadway segments for its first-ever compilation of congestion data. Although Thursday might be the worst drive-time day for Honolulu, Friday was the worst day nationwide. Los Angeles, New York City and Chicago were the worst, second- and third-worst congestion areas in the country, respectively. 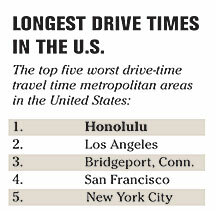 The Bridgeport, Stamford and Norwalk areas of Connecticut -- and Los Angeles -- followed Honolulu in having the worst travel times. The company saw traffic congestion increase by about 2 percent from 2006 to 2007, but stated that rising fuel prices might stem the rate of growth. "The worst traffic bottleneck in our city is directly across from our corporate headquarters, so we're definitely feeling the pain ourselves," said Bryan Mistele, INRIX founder, in a press release. » Honolulu's traffic among worst in U.S.
Cynthia Oi is on assignment. Will resume July 2.